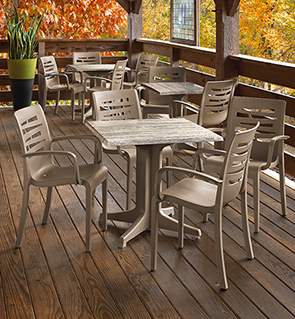 Great for outdoor patios, the Essenza Stacking Armchair offers a welcoming spot for guests to kick back and relax. The one-piece armchair provides a comfortable, contemporary feel which is created by the contoured seat, attached armrests and open geometric design featured on the chairs backrest. Developed to stay cool under the hot sun, the versatile armchair is constructed with highly durable recycled polymer resin materials. The low maintenance Essenza chairs simply wipes clean with soap and water and conveniently stacks for efficient off-season storage.